Marshall defenders Omari Cobb (31) and Chase Hancock (37) celebrate a sack during the second half of Saturday’s football contest against Texas San Antonio at Joan C. Edwards Stadium in Huntington, W.Va.
After all, these Roadrunners spent a better portion of this episode going backwards. 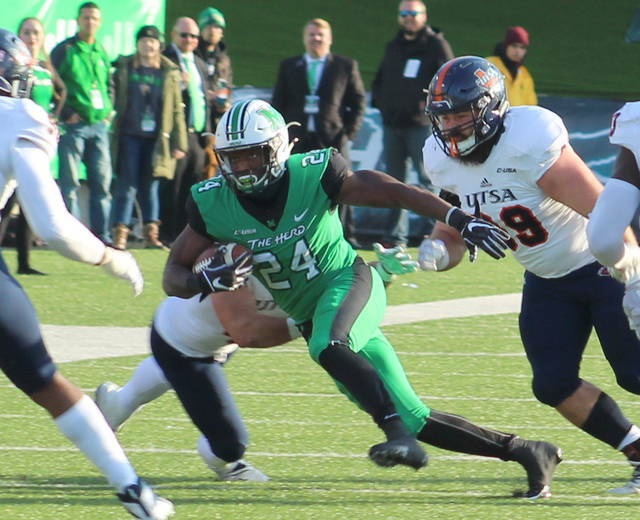 Visiting Texas San Antonio mustered negative-26 rushing yards and had a mere 137 yards of total offense, allowing the Marshall football team to secure its first shutout of the 2018 season with a 23-0 victory on Saturday afternoon in a Conference USA contest on Senior Day at Joan C. Edwards Stadium. 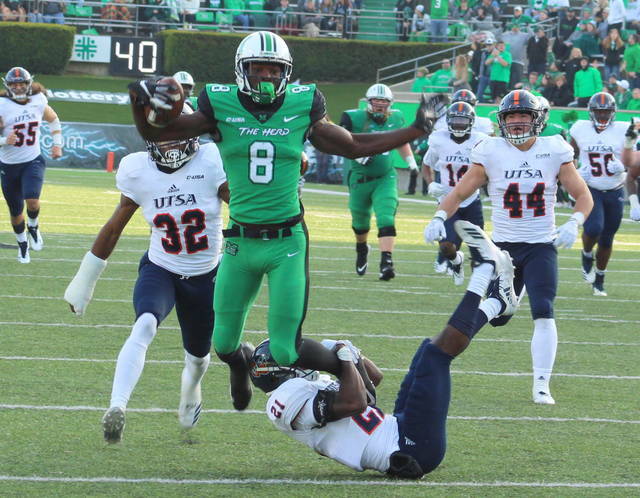 The Thundering Herd (7-3, 5-2 CUSA East) were simply dominant on the defensive side of the football as the hosts recorded five sacks, nine tackles-for-loss and a plus-2 margin in turnover differential — all while limiting the Roadrunners (3-8, 2-5 CUSA West) to just three first downs and 57 total yards before the break. MU, conversely, churned out season-highs in both passing yards (387) and total yards of offense (505), yet struggled to find the end zone for a better portion of the contest — despite an error-free effort. Justin Rohrwasser made a trio of sub-30-yard field goal attempts around a pair of touchdown tosses from Isaiah Green, who posted a career day with 387 passing yards. The Herd owned a 20-0 advantage headed into the intermission. 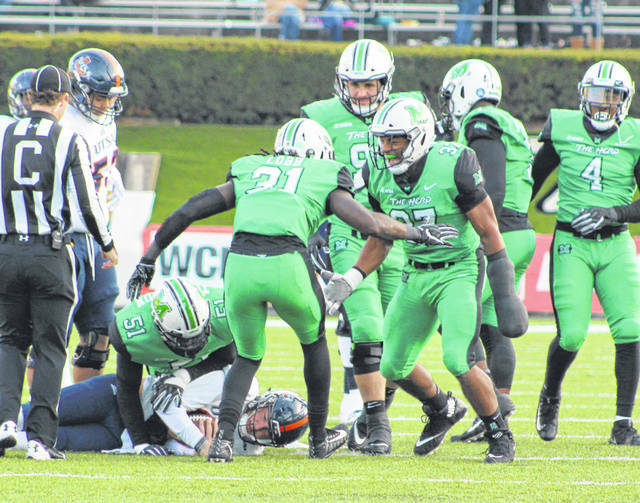 It was the first shutout for a Marshall team in 20 games, dating back to a 21-0 triumph over Kent State during a Week 3 contest in 2017. The negative-26 yards rushing is also a Marshall record for fewest rushing yards ever allowed in a game. Afterwards, MU coach Doc Holliday spoke about how impressed he was with the defensive performance. The ninth-year mentor also took some time to reflect on an offense that was 4-of-6 on red zone opportunities, an area that did have room for improvement. Still, the venerable mentor noted that there were a lot of overall positives in the triumph. “I thought our defense was sensational. They had negative 26 yards rushing, which I believe is a school record. They just shut down that offensive team,” Holliday said. “Offensively we had 500-plus yards, but we have to score points. We were kicking too many field goals, we have to get better at getting that ball into the end zone. Holliday also found the final home outcome special for seniors Anthony Anderson, Ryan Bee, Tyre Brady, Keion Davis, Nate Devers, Aaron Dopson, Jordan Dowrey, Donquell Green, Frankie Hernandez, Chase Hancock, Artis Johnson, Nick Mathews, Donyae Moody, Terence Ricks, Malik Thompson, Marcel Williams and Juwon Young — although he quickly noted that their careers at Marshall are far from over. 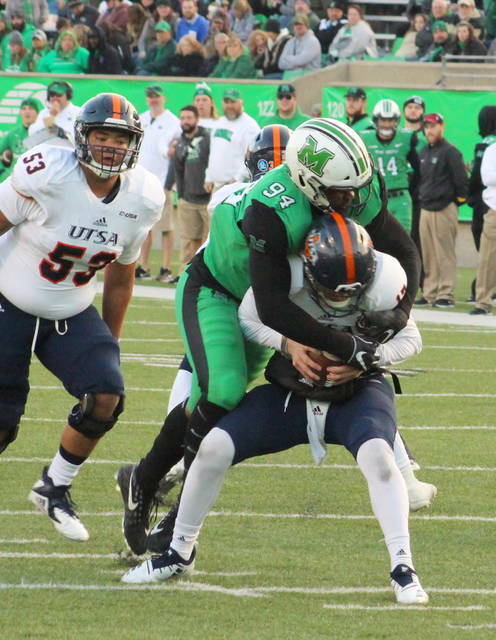 Rohrwasser gave the Green and White a permanent lead after connecting on a 26-yard field goal at the 9:30 mark of the opening period, then recovered a fumble on the ensuing kickoff that gave the Green and White possession at the UTSA 37 with 9:23 showing. 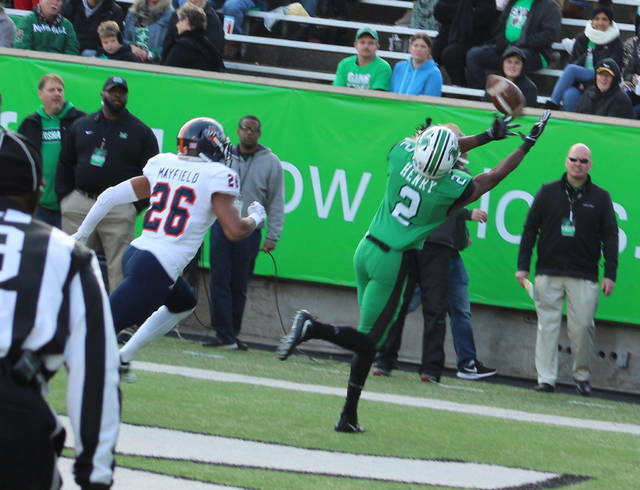 One play and six seconds later, the Herd had a two-score cushion as Green found Brady on a 37-yard touchdown grab at the 9:17 mark of the first period. Both teams went dormant for the better part the next quarter-plus of action, which included the Roadrunners picking up their first first down of the game early in the second canto. 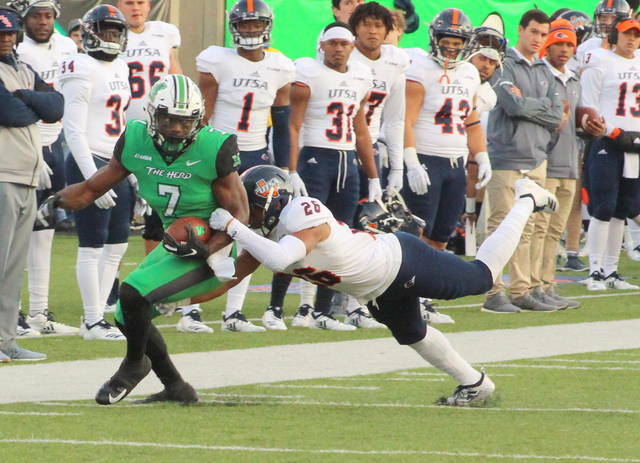 After a punt pinned MU deep inside its own territory at the 10, the hosts used back-to-back receptions by Armani Levias and Brady to cover 82 yards — setting up a first-and-goal at the UTSA eight. After gaining nothing on its first two plays, Marshall was able to increase its lead as Artie Henry hauled in an over-the-shoulder pass from Green in the left corner of the end zone — making it a 17-0 contest with three minutes left before halftime. UTSA was forced to punt just three plays and 50 seconds later, giving the Herd the ball back at their own 47 with 2:10 remaining. The hosts covered 49 yards in nine plays, which led to a 21-yard field goal from Rohrwasser as time expired on the first half. MU outgained the guests by a sizable 326-57 overall margin at the break, which included a 14-3 advantage in first downs and a 6:50 edge in time of possession. Rohrwasser — who missed a 45-yard attempt in the first quarter and had a 40-yard attempt blocked in the second canto — completed the scoring on Marshall second drive of the third period. The Herd marched 76 yards in seven plays, with Rohrwasser connecting on a 25-yarder at the 9:32 mark for a 23-point advantage. 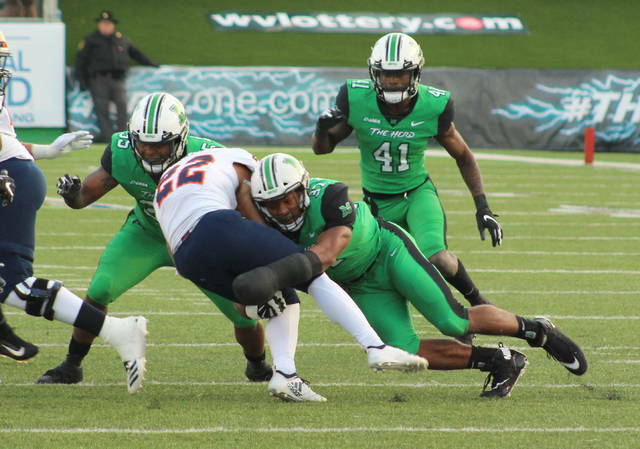 Marshall claimed a 22-10 edge in first downs, rushed for 118 yards and had 18 more offensive snaps than the guests. The Herd was also flagged six times for 49 yards. The Roadrunners, conversely, were penalized 10 times for 73 yards and also had 10 of the 15 punts in the contest. Green’s 19-of-36 passing effort also aided in another piece of daily history for Brady and Obialo, who respectively had six and five catches for 162 and 103 yards. Brady and Obialo became the first MU wideout tandem to have 100-yard receiving days in the same game since Davonte Allen and Tommy Shuler accomplished the feat against Western Kentucky in 2014. Brenden Knox led the MU ground attack with 56 yards on 15 carries, followed by Davis with 49 yards on a dozen totes. Omari Cobb led the defense with eight tackles, two sacks and three tackles-for-loss, while Chase Hancock added eight tackles and forced a fumble. Malik Gant also made seven stops. Tyler Brown joined Rohrwasser in the takeaway category following a fourth quarter interception. B.J. Daniels led the UTSA rushing attack with four carries for 10 yards, followed by Brenden Brady with four yards on 10 attempts. Bryce Rivers was 16-of-31 passing for 158 yards and a pick. Greg Campbell led the guests with seven receptions for 84 yards. C.J. Levine paced Texas San Antonio with 14 tackles, while Josiah Tauaefa was next with a dozen stops. The Roadrunners had one sack and six tackles-for-loss as a team. 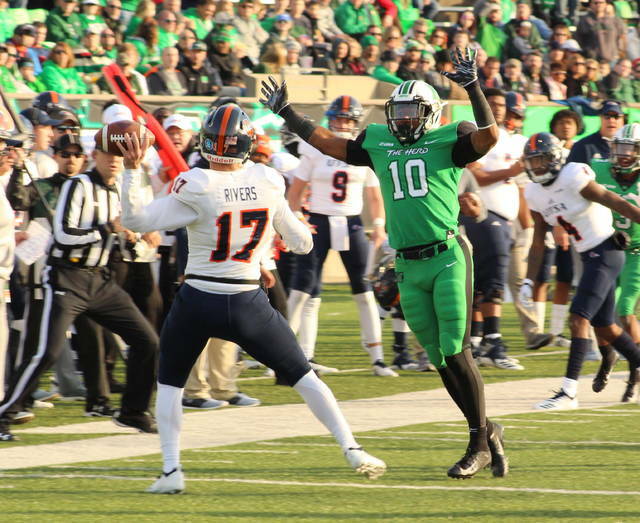 Marshall — which is now officially bowl-eligible — completes its 2018 regular season schedule next Saturday when it travels to Florida International for a noon kickoff.